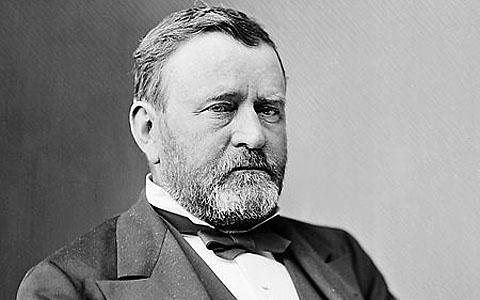 America’s eighteenth president, Ulysses Grant, was elected to his second term in eighteen seventy-two. Grant had led the Union army of the North to victory over the Confederate army of the South during the Civil War. He easily won the presidency in eighteen sixty-eight in the first election held after the war. Now, he would spend four more years as president of the United States. This week in our series, Harry Monroe and Kay Gallant tell about Grant’s second term in office. HARRY MONROE: Grant's first administration was marked by dishonesty and shameful events. The situation grew much worse after he won a second term. Grant himself was not involved directly. But his administration suffered because of his ties to those who were involved. Soon after Grant's re-election, for example, there was a serious incident that involved many of his supporters in Congress. The Union Pacific Railroad Company had helped build a railroad across the American west to California. The cost of building the railroad was very high. The company got large amounts of aid from the government. Not all this aid came honestly. An investigation showed that leading members of Congress, and even the Vice President, received shares of ownership in the company for free, or at low cost. In exchange, they voted to use federal money to help build the railroad. KAY GALLANT: A few months later, members of Congress voted a pay raise for themselves and the executive branch of government. The pay raise would be retroactive. This meant the extra money would be paid for the two years already past. Newspapers and citizens raised a storm of protest. Some lawmakers were afraid they would not be re-elected. So they refused to accept the pay raise. Within six months, another shameful incident was uncovered. This one involved Jay Cooke, one of the richest bankers in the country. He also was a good friend of President Grant. In eighteen sixty-nine, Cooke began raising money to build another railroad across America's west. He planned to sell one hundred million dollars' worth of railroad bonds. Many people invested all the money they had in Cooke's railroad. But Cooke was unable to sell as many bonds as he expected. Soon, his banks had no money left. They could return no money to the thousands of people who had bought railroad bonds. HARRY MONROE: People hurried to other banks to withdraw their savings. Within hours, many of these other banks had to close. They, too, were out of money. Within a month, more than five thousand banks across the country failed and closed their doors. This created an economic crisis. The New York Stock Exchange closed for ten days. Factories closed. Thousands of people lost their jobs. Investigations showed that many of the banks that failed had violated banking laws. The laws often were not enforced, because so many bankers had given money to the ruling Republican Party. KAY GALLANT: Other incidents followed. One of the biggest was called the Whiskey Ring. It involved a group of whiskey producers and some high officials who were friends of President Grant. Together, they found a way not to pay taxes on their whiskey. One of Grant's close advisers was at the center of the incident. A grand jury found him not guilty of any crime. However, it charged several hundred whiskey producers and government officials with illegal activities. President Grant had done nothing illegal. But the Whiskey Ring incident increased public feeling that there was no honesty in the White House. The feeling grew that Grant was a failure. HARRY MONROE: These incidents took place during a time of intense social and political change in the United States. The period after the Civil War was a time of industrial revolution and business growth. Most of this growth was taking place in the North. Before the Civil War, most businesses were small. Now there were many companies with large numbers of workers. The companies also had large numbers of owners. They sold shares of ownership to anyone with enough money to buy. KAY GALLANT: A few men rose to positions of great power in business. In the steel industry, for example, there was Andrew Carnegie. He came to the United States as a boy from Scotland. He took a low-paying job in a factory that produced cotton cloth. He worked hard. In time, he earned enough money to take control of an iron factory. Carnegie soon built another factory. This one produced steel with a new technology. The system worked well. Soon, he was earning more than one million dollars a year. He competed fiercely with other steel companies. He pressured railroads to transport his steel for lower prices than his competitors. And he cut his prices to force other steel-makers out of the business. Before long, Andrew Carnegie was the unquestioned leader of America's steel industry. His position gave him great power over the economy of the whole country. HARRY MONROE: What Carnegie did for the steel industry, John D. Rockefeller did for the oil industry. Oil became a useful product only in the middle of the eighteen hundreds. 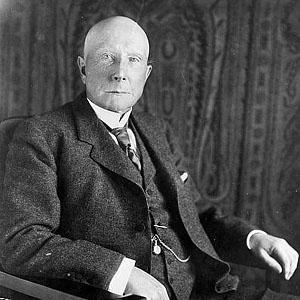 Rockefeller was part of a group of businessmen who built an oil processing center in Ohio. It was so successful that Rockefeller gave up his other business interests. He put all his money into oil production. He formed the Standard Oil Company of Ohio. John D. Rockefeller's new company used the same aggressive business methods as Andrew Carnegie. Rockefeller bought control of other oil processing companies. He started price wars that forced his competitors out of business. Most important, Rockefeller made a secret deal with the railroads. The deal greatly reduced his transportation costs. This permitted him to crush his competition. Before long, he controlled ninety-five percent of the oil processing industry in the United States. KAY GALLANT: As with steel and oil, America's railroads were an extremely important business in the eighteen-hundreds. In fact, they were the nation's biggest business. They were as important as automobiles and airplanes are to the American economy today. Before the Civil War, most railroads were east of the Mississippi River. Most were small lines. In the years after the war, four major railroads got control of almost all the lines in the east. And they began building new lines in the west. HARRY MONROE: The first rail line to cross the nation was completed in eighteen sixty-nine. It was built by two companies. One company started from the east and went west. The other went in the opposite direction. Finally, after six years of back-breaking labor, the two work teams met in northern Utah. They connected the rail lines with a golden spike. It was a great moment in the nation's history. Now, at last, the two coasts of the United States were united by a single line of metal rail. It was like the day -- a hundred years later -- when the first American walked on the moon. KAY GALLANT: Like the steel and oil industries, the railroad industry also had its stories of intense business competition. In this case, the most influential man was Cornelius Vanderbilt. Vanderbilt already was rich from the shipping industry. Now he formed the New York Central Railroad. It was the largest railroad in the east. Cornelius Vanderbilt tried to take over the railroad industry. He was not as successful as Andrew Carnegie with steel or John D. Rockefeller with oil. A group of other rich railroad owners blocked his plans. But Vanderbilt did succeed in winning a great amount of power and influence. HARRY MONROE: Vanderbilt and the other new leaders of industry were powerful. And they let others know it. They sometimes made statements about how they did not have to obey the law. Other powerful men thought the same way. Some were officials elected or appointed to serve in the federal government. Political power blinded them to their responsibility to be honest and fair to the public. As a result, the Republican Party lost public support. The blame was placed on Ulysses Grant. That will be our story next week. BARBARA KLEIN: Our program was written by Frank Beardsley. The narrators were Harry Monroe and Kay Gallant. Transcripts, MP3s and podcasts of our programs can be found, along with historical images, at www.unsv.com. Join us again next week for THE MAKING OF A NATION -- an American history series in VOA Special English. steel,oil and railroad were developed well from the middle of 18 century in the USA.but far away from east Asia ,china which is one of 4 ancient countries,was breaking out wars.